These pages will be updated on an almost daily, certainly weekly basis, from all the mail and information coming in to us. The 'What's New on the Site ' page will now be accessed by clicking on this and will only be updated if we add a new feature or special page etc. their store. You nominate the donation you want to make, then "purchase" it. amount again from their own funds. second page Administrator Scott describes how the donation system works. The scheme will be held open only until 7 January. We have at last passed the 100 on the Forum! That's 100 owners and friends signed up who can start threads and answer some of the other threads, particularly the new one about our 'Constitution'. You will notice you cannot get onto this one without logging on. It is not difficult. Have a Go! Having amended the 'Ask Advice' page I immediately got a request. This makes me cross that I did not notice it was not working, earlier. It means we have missed some of the enquiries perhaps... It was working up to the summer, but there was a slight hic-cup with a server problem and I suspect that was one of the casualties. The family have left now and quiet has once again descended on Bluebell Cottage, (Just who's idea was it to buy that drum kit anyway!) And I am left playing with an expensive present the family have given us, a magic bit of kit we can take on the boat and will amuse us through those late evenings when the rain is lashing down outside, a mini DVD player, small yet works off 12 volt and big enough for Darian to watch her favourite films on. It set me thinking about all the leaps in technology we have seen in the 'relatively' few years, since we have been sailing. My first Eventide Bluenose was the only boat in the creek at Tollesbury with a VHF in the late 70's, look at what we have now! From the early Decca's to the latest plotters, in between we have seen the mobile phone and the handheld GPS, EPIRB's and affordable safety gear of all sorts. What changes! My first Eventide, 'Bluenose', in 1973, still had Cotton sails! When I think about it I realise just how fortunate we are to be living and sailing now. I just hope the improvements to water purity continue and we can keep off the grubby hands of those who would tax our pleasure , so it is available for the next generations. A Happy New Year to you all in Eventide Land, here's looking forward to another good year. At last I have got the constitution page on! We need a bit of feedback on this one as we want to agree it by the end of February and our second anniversary! I have opened a discussion page on the Forum and have already had a congratulatory mail within minutes! Take a few minutes to have a read. Today after another mail, I checked a few of the 'contact us' buttons. A member found one with the wrong address, he soon sorted out the problem and mailed through to us, but I found a further 20 pages with duff links. I think they are all fixed now, but if you find one that is not, please try and tell us. I hate to think how many mails we might have lost, seeing as we have had so many, it could be a high number. After a mail from Sweden, I was prompted to update the page with the maps on, It is not finished yet, but I have added a lot of figures to the lists of counties and countries. If your county is not yet listed with your boat, let us know! Check out the new edition of the Newsletter, the 'Scran Bag' page is attracting comment! I hope you all have your parcels wrapped, time to close down for a day or so, let the dust from the festivities settle, and yes I was out there to celebrate the Solstice with my Yule fire! Have a good one, the days are getting longer, by minutes, but longer! From 1215 tomorrow approx we are into longer days! I have by the magic of broadband, been able to update the builders and restorers page adding loads of great pics of a Tidewater being refurbished. Leo in Holland has sent in a load of pics of his project. Barry is hard at work preparing updates and rewrites of several sections of the site for the new year. Of course with the advent of Broadband it means more can be done much quicker, so the site will expand yet again I suspect. Again I am having requests for printouts from the site and we are looking at ways to make that easier too, even pdf file down loads. I have heard from another Eventide owner with a hitherto unheard of boat, another one surfaces.. Seems the jungle drums are beating loud and clear! I am happy to say that I have just renewed the Domain Name of our site till 2007! Also the webhosting. I will put details on the Accounts and Donors page soon. We have had many seasons greetings, and David Cooper in particular, Ex owner of Eventide 'Evenstar', wishes us all a good Christmas. Barry and I wish you a happy Yule, Christmas or whatever, may it be peaceful and your new year a happy one. Sorry for absence for last few days, but today is a real red letter day! We have gone Broadband! It has taken a little jiggery pokery to get it right and we were off for 3 days, you should see the mail bag when I logged back on! We will get back to you all ASAP. we have 2 new registrants in amounst the mail, boats sold, amendments for site, pictures to go on, people wanting to be in touch with other owners and all sorts, even a couple of Christmas best wishes to pass on.. will catch up in next few days. The Christmas fairies and snowmen are back! The Newsletter is off to a good start, and I have just had some more articles in< when I have found time to type them up I will add them. we will be needing more pages soon! Seasons Greetings to all our friends out there, thanks for your support! All 242 of you! I have heard from another three owners and a yard selling a mystery boat. The owner selling, thought it might be the prototype WW, but no, it is a double chine, Eventide shape, stretched to 30ft. Looks like it is an MG, but which one, or, it's my guess, it is a one off mix of many, based on a set of Eventide plans. It will appear on the for sale page soon. One of the owners who contacted me has sent an excellent story to start off the newsletter and I am working on a Senior story, sent in by episodes! I have spoken to the owners of Avocet, who were snapped by one of our number, who wanted to pass on pics, and have a promise of an interesting log of their voyages around the Scottish Islands. Burgees are still selling well, sold another one today, that will appear in some lucky owners Christmas stocking! Have you got yours? We have now got to the stage where we are able to repay the loan that we were given to buy the flags, and still have about £200 left in the kitty to pay for the site till 2007! Thanks to all those who have sent in a donation, see the 'donations' page. I have had yet more photos in and another owner has just sent enough to start a new page in the restorers section. We hope to have that on line inside the week. P.B.O have been back in touch, they are impressed. We are keeping in close contact now with the magazines. There is a nice little article by Geoff in Classic Boat, they wanted a Senior, so I passed them to one of our advisors! We are getting a list of events forming for 2005, how about you in the South or North West, want to give us a date and venue? Have a look at the list, we have a lot of interested crews already! Well last night at Danbury was one of the best we can remember. 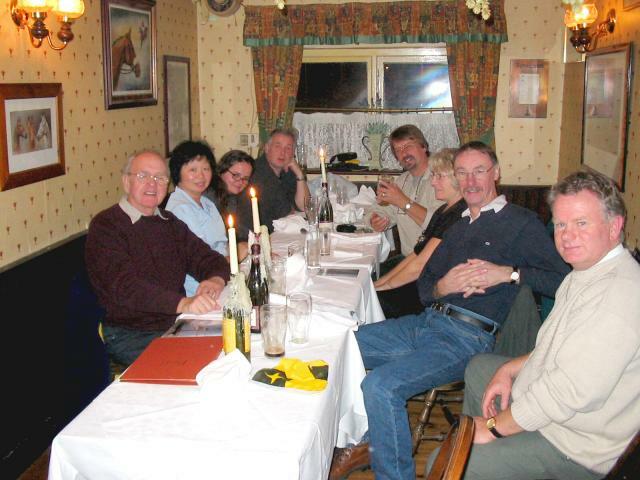 Sixteen owners turned out for an evening meal or a pint in great company. And we were missing some! I still have the tiller Andrew! There were so many photo albums going round! Sadly Barry could not make it as he was tired out. After all he has been through with his illness, the night before, the new plumbing in the loft gave way.... mains pressure! The water came through bedrooms, hall and bathroom, plunging them into darkness of course, as all the lights fused! He has spent the day trying to keep out of the way of the army of contractors men who came in to try and make good. Dehumidifiers and squeegees! The reason for the flood? An apprentice forgot to fit a special washer in the fancy plastic push fit plumbing.........Every one asked after him, he was missed. Tony Scrace had some great stories to tell, he is the gentleman who built in Rhodesia, and escaped overland to South Africa with his boat. His boat is a 30 ft M.G. design, larger than an Eventide but along the same sort of lines, she has a rounded transom and hollow keels, 'folding' masts and various other special design features. We hope to see some of the photos on the site in a special feature soon. Plans were discussed for another trip to up the London River next May B.H. several more boats may be coming next year! Mike Hoban told me he has a berth on the Blackwater for next season and Sid hoped to be able to sort his boat in time to join in with us too. There are logs of the 'Dutch trip' and others from further back and further afield promised, hopefully for the Newsletter. Darian turned up in time for deserts! She had been working till well after 8, She like all of us circulated around that end of the 'Bell' that we take over, many friends to see! Mike told us he had his boat lifted and his crane driver gave him a weight of 2.6 tons, for a E24! My old E24, Bluenose only went 2.25 ton with a 1000lb keel. Anyone else got theirs weighed? My E26 is 3.5ton, but she is stretched to 27ft and has 2240lb of ballast..... I thought Mikes boat was very heavy at 2.6 ton. She has got a slightly different keel, but as the plan weight showed 1.5 ton?? (We know that was light..... it was with a 500lb keel and small inboard....) Even if it did have all the cruising kit on board. How many tins of beans did you say Mike? John and Anne are making progress with their rebuild, I am trying to get them to put pen to paper and Andrew is going to send me a horror story about the two stainless steel bolts he removed! ( replaced with galv steel!) He will be ready to sail with us next season in his M.G. 'Swin' class! Margaret is getting her kitchen and bathroom done ( after 20 years of Alan's boat building!) and Stephen Fryer has worked out where all the bits go to rebuild his late father in laws Eventide that the family found and bought back. Another story there! John Stevens is selling his Senior to look for an E24, though he is presently helping Tony Scrace with his M.G. boat, another story... Sid is determined to fix his leak and be out there with us too. We are not meeting over the Christmas period, so the next Danbury Meet will be the end of January, the 26th. see you there! Happy Birthday Christine! It's my little sisters birthday today! I hope I can buy her a lemonade at Danbury on Wednesday. So far we have heard from the following, that they intend to be there.. John Stevens (Got the parcel) and Tony Scrace, Andrew Wallace, Jo and Andrew Fox, (got the tiller this time! ), Doug and Jo, John and Anne, John Parry, Stephen Fryer ( have box of goodies for you too! ), Alan and Margaret, Sid Taylor, and myself and Darian! Looks as if we are taking over the pub! Barry and Chris hope to pop in, Barry's health permitting! He wants to get another pic for the site! There are going to be a few pics to see and a few tales to be told no doubt.. Tony Scrace's tale is a good one, I will have to get it written down for the Newsletter! He built in Rhodesia and shipped to South Africa, lived aboard then after Hurricanes and tempest, violent mutiny too I understand, eventually shipped to the UK as deck cargo..
Hope to see new friends too, pop along and see us. Over the past few days we have had more pictures added to the site, thanks to John Stevens for his efforts in tracking boats and also to Antonia, see the MG designs page for hers of her 'Banjo'. Now do any of you remember seeing a pic of 'Banjo' somewhere?? East Coast rivers maybe.... I am sure I've seen her.... It's me age! A boatyard selling what they thought was a WW have got on to us and we may well have that on the site soon, I think it is a GH. We have had a sale on the 'For sale' page and a price reduction on 'Penny'. We have also had yet another plans request, sad to say we have no address to pass it to....But we have offered to let the enquirer look at our drawings if they are rebuilding and just need dimensions, only fair! With the rain pelting down I am very pleased to have the boat ashore, the wind is howling and snow is forecast, Brrrrr! In the last day I have heard from Andrew Wallace, that Swan has been sold... To the great grandson of a former owner and we hope to keep in touch with him, as the boat has a special interest to us. We have also heard from Malcolm Jolly that he is attending the Portsmouth 2005 celebrations in his Lone Gull II, 'Foreland Gull' and would love to meet up with others. You could have a cruise in company to get there or a South coast Meet as a result. See details on the Events page. A little birdy told me Roy Lewis had his engine going today on 'Camelot' sadly I didn't get to see him as I was lowering the mast and a bit sort of ' preoccupied'. Mainly because I had just lost one lens out of my specs... the effect are most odd, and more expensive than getting tiddly! We have had another donation and the promise of a bumper turn out at Danbury on the 24th. Look forward to seeing you all there. Sail covers have already been through the washing machine, halyards next, but I'll wait till she goes to work before I pop them it! The occasional clunk from a hard bit makes her wince! All for now keep those pics coming in! In the past few days I have had numerous calls, e-mails and even a couple of letters. One had a CD full of pictures, that you can see on the featured boat section or access from the photo of the Eventide 'Magog' on the photos page. that alone added another 15 pictures of an Eventide. We have found some more boats for sale and are in touch with the owners and one boat changed hands and the new owner has been in touch and joined our number within the day. Registrants stand at 241 today! Another owner has been on the phone about a rudder problem, and we hope to supply him with enough information for him to make a new one this winter. I met Tony Scrace during the week, as he and John Stevens covered over Tony's boat for the winter. they are both coming along to Danbury on the 24th, as are a lot of others by the sound of it, I will have to book a bigger table! There is a new page added to the For Sale page, to warn of some of the frauds that are about, worth reading. thanks to my friend Phil at www.boatsandoutboards.co.uk for that. We have heard from more owners this last week and the Eventide count alone has risen to over 80 on the photo gallery. We are looking forward to hearing again from the gentleman in Germany with a 'Hacathian' and have had the promise of a couple of articles and lots more pics. Nigel Thomas has given details of not only Kandy that he once owned, but of Caorunn, Puffin and Karelia, that were all once owned by his friends father. He was actually allowed to borrow one, that is probably what hooked him in Eventides too. He is currently thinking of buying another one! We know where Kandy is, where are the others? I used to reckon about 500 Eventide got built, but with the number of new ones coming out of the woodwork, I am not so sure.... It could be many more! We hope eventually to have many more listed! We are certainly heading for 100! I have just been instructed how to set up the third edition of our 'Newsletter' and the pages are ready to accept all those promised logs and articles, photo and hints!!!! Come on all you keen owners out there, more info needed to pack out this website. All the yachting press are now watching us, they have at last twigged we are the real owners group and are interested, lets show them how good we are! One of Barry's friend's sent our webmaster Barry this picture of one of Barry's favourite places. Mevagissey. Not a day to go out sailing! The photo was used by the BBC in Cornwall on their website. Great picture Roland. With twin centreboards in cases by the shrouds, and in M.G. 's own words, 'hardly a straight line anywhere', she is a pretty little boat. Andrew Wallace, one of our number, himself owning an M.G. design, has sent these pics in. She is in a creek near him at Leigh on Sea. Built in Chiswick in 1897 She is now in a run down state, considering her age, 107 years! Not surprising. She could well be for sale!! Andrew is to make some enquiries and come up with a contact we hope. Fancy a project? It's even got a Seagull bracket on it! Now there is a thought! Another good night at Danbury last night 9 attended, and several sent apologies. This morning I heard from others who will be there next time. Barry wasn't up to it last night, but sent his best. Loads of photos swopped, lots of info gained and we hope we might have put one prospective owner in touch with a boat owner who wants to do a boat share. We will see. We did not get to talk about the new constitution, but instead will put it on the site and invite comments. To comply fully with the 'Charity Commission' we simply have to show accountability and abide by a few simple rules. Do not see it as a problem at all. Sold another couple of burgees plus some goodies that were for sale for the site. We are already planning next seasons Dutch trip, two weeks this time! My mailbag is full of enquires again today, new members too, we will soon be over the 250! We had one mail from the seller of a boat on the site, wishing to be removed from the list sadly, but they have really swallowed the anchor and no longer wish to be part of boating, so we have deleted them. It is the first resignation in 235 registrations, not bad! Sadly we have also lost a few through 'natural causes' but have not deleted them.. (the 'real' number still stands at 230.) I would not remove those who have given support, even though they are no longer 'with' us. They are still here in spirit. We have a lot to do on the site in the next few weeks, the newsletter needs an up date and we have lots to go in, though if you have a log or article to add, great. there are new pages to do and pages to update, ideas coming in from others to follow too. Hopefully you can see the difference on the for Sale pages. they are all tidied up and we hope, up to date again. I have several CD's of pics to go through to add more photos and maybe a book review too! Busy busy! We have been contacting all those who have taken advantage of the 'For Sale' pages. We did not want out of date adverts clogging up the system. We have found a few with the wrong telephone numbers, some we have deleted. If you had an advert and we have not contacted you, please see if it is still there or correct and inform us or resubmit it if you need to. It has been great to chat to so many of you, thankyou all for your kind words, I have passed them on to Barry too. It seems the boat market has gone as quiet as the housing market......? Is it that the dreaded season of spending is fast approaching?? Or are there bigger concerns we wonder. I for one, am stocking up on wood and got the generator going yesterday! I'm working on the premise that it is about time we had a hard winter and betting the power will go out! The boat will be well tucked away for the winter again, in a friendly farmers barn, can't beat that! Roll on next season! A word of warning. We have heard that there are unscrupulous people out there who are trying to con others out of money. One of the tricks they use is to seem interested in an item for sale, then ask for all your details stating they will pay over the odds to have the item shipped. Of course they have no intention to pay you and if you part with goods you will never see the money, and probably have the shipping cost to pay as well. Advice is clear, do not sell without first clearing any cheques or money orders and do not give any details of your private bank account to others, well you wouldn't would you? We have reported one such individual to the proper authorities. After just a couple of nice days away, the forecast being dire, we skated back home. As it is blowing and pouring with rain at the moment, we think we made the right move! I did however find out why Pyefleet is not so good for anchoring as it was.... weed! possibly connected to the 4" of silt all the creeks have collected after the managed retreats near here, the sea wall being breached, (nothing religious! ) The creeks have all weeded up, indeed at LW Tollesbury and Salcot have the looks of a well mown lawn! The anchor came up festooned in weed! It again did not bite as it was just collecting weed, not digging in at all. The layer of fresh silt seems to act as a lubricant and the hooks slide over it! On my return there were some nice mails in, We have managed to put the 75 year old builder of an Eventide in touch with the current owner, who is more than pleased to be asked. We have had more pictures in and more adverts too. More information about boats has come from the ex owner of Kandy, and updates on adventures from others. we have a new edition of the Newsletter in the making! Another batch of new photos in over the weekend, new boats, 'Naamah' and 'Golden Mongoose', 'Eloise' and more of 'Huff'. News that 'Pegasus' has moved from Ipswich? anyone know where she is? A new WW. 'La Vela' has appeared at the Orwell Y.C. Lots more mail and a couple of odd enquires. It's never a dull day here! Loads more pics in numbers up to over 170 different boat! Another 6 registrants in the last week or so, some very supportive letters too. Thankyou to all of you that wrote. Registrants over 230!!!! We have promises of logs from several corners of the globe, and Essex! One mail in from Andrew Wallace, says he has found for sale in his Essex creek, the original 'Swan'. The little Barge yacht that featured in MGs first book, 'The Magic' Not in the best condition, but capable of being restored.... We look forward to hearing more and maybe putting an article on the pages. Andrew's own boat is the 'Swin' class boat featured on the MG design page in the gallery, more pics to follow. Was out for a jolly Yesterday, went and checked my spare mooring. All's well there. If anyone wants to visit the beautiful Blackwater for a short stay next season, and needs a temporary mooring, contact John at 01621 778859 for more. Looking at the weather for next weeks cruise.... some say it will snow! Not on me it won't! Just back from a weeks holiday, walking round a small island with just the sea and Darian for company! Idyllic! Back to earth with a bump, a host of mail and pictures waiting for us on our return. What with my Tree Warden duties, taking all the 120 Village children out seed collecting , planting etc and the Seagull enquiries etc, not to mention Parish council and my RNLI lectures, I have not really had time to put my feet on the ground yet! I hope to catch up on all the mail shortly. The number of registrants has jumped to over 230 and the photo count is getting silly. we are on our way to the 1000...! We are off on the boat for a few days next week, weather permitting, then all meeting at Danbury. that should just about wrap it up for the season. Have had news in on the MG Swin class boat from Andrew Wallace and more stories about Older Eventides too. Latest registrant has a Senior and enquiries in about building in steel. Any Steel builder out there willing to answer queries? The website has just passed the 200Mb size! The number of photos on the photo gallery alone has passed the 500 barrier, the number of registrants has now reached 225! The number of different boats has exceeded 160! We have to be doing something right! Just loaded another page of pictures on the 'Builders and Restorers ' pages, the 'Tuphnol Boat! John has really got on well this year. We hope to meet him afloat as well as ashore next season. Have just spent some time adding a whole page of wonderful Wild Duck Pics to the W.D. page, ( Far too Breezy for a sail today!) See the link to 'Beautje'. also added another 'unidentified' craft to the pages, can anyone help? Three years after the Twin Towers and Washington, we remember those who lost their lives and ask all to spare a thought for those left behind. Just back from meeting with owner, Mike Hoban, he is thinking of moving his Eventide to the Essex coast. Wise man! Lots of places to go here, even on a blustery day! Post in today from Spain, Kathy and Roger have sent more pics of 'Jua' for me to scan onto the pages, thanks to them. The nuts are growing well on their farm in Spain! No not Kathy and Roger, Hazels and Walnuts!! Heard from Andrew Wallace, he has bought the MG centre cockpit boat from the website, welcome, hope to see pics soon, and Mistress II has also sold from the website new owner Andrew with us last weekend. Also the 'new' owners of Meldrum the WW featured in the 1962/3 boat show photo have told me they just returned from a 2 week cruise to Cornwall, hope to twist their arm for a log! Another log might be coming from the owner of 'Gooney Bird', just put up for sale on the pages. Real deep sea stuff I hope! Just had several sets of pics of West Mersea in, more for the site, will get some on next week. Just heard 'Cabanade' the Barrier Reef 38 is now a houseboat on the Colne, how ignominious! Call from John Parry with that Tuphnol boat, launch put back a bit as sheathing needs replacing, suggested sanding off and rolling on an epoxy coating, anyone else any suggestions? Also Simon Grey has sent in pics of his boat that he thinks might be a 'Bawley', will get pics on during the week. Loads of post today! Loads of calls, more e-mail than ever, great! Postman yesterday brought a lovely letter from Kathy and Roger, with a pic or too, they will be on the GH page ASAP! Also more registrants, Andrew Wallace has bought an M.G. design, pics to follow, and 'Sea Breeze', advertised on the site has sold, the new owner Steve, is with us too! Hope to hear more from him as he completes the fit out! CD full of pics arrived last week, will sort through and get some on the site, they are of the Holland Trip! Heard from John Parry with the Tuphnol boat, launch put back a bit, as GRP sheathing found to be detached from hull.... Suggested rolling on a coat of epoxy, no sheathing, that will speed up launch day.. Worked for F.G.! I am so pleased that so many are getting in touch and sending info, I am finding The E.O.G. is now more active than I was ever in the past! And so much friendlier!! Stuart Bailey reports that he is re-launching his Eventide 24 'Tamerisk' over the August Bank holiday, at Beaumaris North Wales. Hope the weather was kinder to him than it was on the Essex Coast!!!! Stuart promises some pictures to add to the gallery. Look forward to seeing them. Lets hope there is better weather for the rest of the 'Season'! We are sad to report the Death of Peter Coates. Peter, the builder of the Gaff Rigged Eventide 26, 'Cameroon', passed away peacefully at home after a long illness. Peter was a long time supporter of the EOG. He had sold his boat due to his illness, but kept in touch. He had been the auditor for the eoa for many years, before he resigned from them. 'Cameroon' was often seen out on the Medway and even during his illness, Peter would often go to her just to sit aboard and watch others sail past. We will miss him. Our thoughts go to his family. Membership now stands at 220! It seems that every month brings in another load of owners to back the group and supply more photos and information. We in the EOG have no axe to grind, we are just a growing group of owners who love their craft enough to want to sail and nurture them, actually to own them and to share our experiences with others who are rebuilding, sailing or wanting to sail similar boats. We are particularly pleased to see so many other MG designs now coming forward. The number of ex eoa members is still rising, they are not fooled by the deceptions of the others! After a great time in Holland, 2 weeks cruising, or just over, we met new friends and old ones, found more boats and owners and spoke to others in the area who could not get to us sadly, due to time constraints. Next time we will spend longer. We made the Goes meet, 4 boats and 2 extra owners/friends.! The Dutch were as friendly and welcoming as ever, the country, the people. A wonderful week in very good company. The logs and pics to follow! With the weather a bit more friendly than it was last week, there will be three boats leaving the Essex area for Ramsgate and then Dunkirk/Neiupoort on Thursday/Friday. If you are meeting us in the Netherlands, we hope to lock in at Vlissengen on Saturday, be in Middleburg Saturday/Sunday, picking up lady crew there, then into the Veerse Meere, to be in Gooes for Wednesday 21st. Call 'Fiddler's Green' on VHF 16 or maybe 72. We have heard from some of the Dutch contingent, so hope to meet up with them. I will have a small stock of burgees on board too, selling fast! Congratulations to Brian West, one of our ardent supporters and an ex owner. Brian has just been appointed as a Justice of the Peace. As a good friend of John's for over 30 years, his support of the members at that nasty AGM and in the intervening period has been much valued. A sensible level headed person, whose council is held in esteem. A worthy accolade! Well done Brian. This is typical of the the calibre of the supporters we have. June 26th The Burgees have arrived!!! See link on home page. 19th June. The mystery photo is of the Phoenix unit off Shoebury, Essex. Otherwise known as part of the 'D' Day Mulberry Harbours. This is one that did not make it, breaking its back on the Essex sands. The connection to M.G.?? Maurice was in charge of the 'Corncobs', the fleet of old ships that were used as the outer breakwaters to protect these Mulberry harbour units after 'D' Day. !! Did you know that? J.W. 14th June We have passed the magic 200 registrants today. that does not count the ordinary mail , that is just the number of owners and 'friends' those selling or buying, that have actually sent in a registration form, or letter of support. And they keep coming in! We must be doing something right! We have dozens of mail applauding our stance and supporting the website, thank you to all. Thanks also for the pictures and articles and of course the donations to the EOG. Every small amount means we are able to continue providing the resource we do, Thanks. The EOG. 9th June The flag is ordered! Watch this space as they say! 8th June, Any one fancy a trip to Londonderry? We have been offered a special rate at Foyle Pontoon, speak to John on 01621 778859 for more. 27th May, Another very pleasant evening at The Bell, Danbury, Essex. 11 owners turned out for a meal and chat. We decided on a design for the burgee and sorted out arrangements for our weeks cruise to London too. Great to see friends from Kent and West London turning up too! Lots of chat and laughter! 13th May Our Web Site appears in Sailing Today - June Issue. Click here to see the article. May9th. On a much Happier Note today!! Yesterday Barry and I were privileged to attend the naming of a new Riptide. Sid Taylor has taken the covers off his creation! Sid, a staunch supporter who resigned from the other lot soon after that nasty agm we all went to, has been building manfully since 1990 or thereabouts, might even be longer! He has produced a heavyweight sailing cruiser, fit to go anywhere! She looks massive. At 32ft she is really a timber Noontide. I have taken some pics and will add them to the Riptide page, with the others of 'Ramilles'. The name, after a British warship of that name that his uncle served on! Sid is no newcomer to sailing and it showed in the detailed touches on board, she is to be moored on the Blackwater and will be a welcome addition to our growing fleet! We will have a report of her sailing trials soon! Long may she sail among us! May 8th. The latest edition of the eoa bulletin has just been sent to me by an ex member, who was an annoyed as I when he read it. It is full of untruths! menamin has not been sacked, as we were told, they are actually supporting his continued streams of lies. No, I did not not ever sue the eoa nor indeed have I ever been 'in dispute' with it. I simply removed my support for those that deceived and lied. Menamin is asserting that the letter sent to all was not his doing, though he wrote it, signed it and sent it, it was that of the eoa, and as such therefore I am in dispute with them. Tosh! We know the eoa had nothing to do with it, however the eoa committee, by backing the liar, have backed themselves into a corner, the only way out is to admit and apologise, and they seem unwilling or unable jointly to do so, even if individuals secretly admit to us that they aught to! What a stupid state of affairs to get into. Had they listened to the owners this would never have happened. Mr. Eatwell seems to think it is quite OK to be libelled, wonder how he would feel? A lot of us having heard him at the eoa agm could not understand his tone. As we thought he was liable to a coronary, we did not even respond to his nasty attack. They apparently are blaming the owners who attended that agm, for making it unfriendly! What a farce. I am so glad I taped the proceedings! Would anyone like to hear a snippet of it? Some of it is priceless! The CA were appalled at their conduct. They then try to show how committed they are by showing their ownership of the boats... it falls flat on it's face, when apart from the token Seniors, as wrecks, (remember that little deception?) passed among committee, most have either sold or are selling! In addition Beazer, the last Eventide owner, who has been selling his for ages, has not even admitted it on their pages! He was so cross when I exposed this new deception! As I said, will the last to leave, turn out the light. I am saddened that others, who I deemed to be sensible and honest people have been duped into lending their names to the eoa. It appears they have been swayed against me. What does one have to do to prove ones honesty to some, walk on hot coals? I can only say that time will tell as the truth will always out. I will accept your apologies at any time. In the meantime all the reasons the eoa went bad will be replaced on this site and now the Crown Prosecution Service are likely to be involved! All because the man could not say sorry! News is coming to us, from a number of you, that the old eoa is trying to win you back with a free copy of their Bulletin. They desperately want your money. We think we know why. We have recently found out that a considerable sum of money has been used from eoa funds to pay for mcmenamins solicitor. Now, as I took a personal libel writ out against mcmenamin alone and my solicitors only letter to some of the members of the eoa committee of the day, (the ones who had not already admitted they knew nothing of the libel), produced two further proofs, that indeed mcmenamin wrote it off his own back, without approval, simply using eoa letterheaded paper, we wonder why this should be... No further letters were ever sent by my solicitor to any one else but the man who committed the libel. My solicitor easily exonerated the committee. It has been suggested that the committee had been told they were still liable, this is a lie. It did not come from me. It seems however mcmenamin was unable to force himself to make that simple apology, requested for over 10 months, despite repeated requests and letters from others too. (See letters page.) He blamed the others in the eoa, who were plainly innocent. We know they had nothing to do with it. So why have the eoa's funds been used to pay his personal and unnecessary costs? ( He could just have said sorry!). If there is any one who might still be a member, willing to confirm this, my solicitor would be very interested to hear. We may be entering a new era of criminal proceedings. There is also a possibility of 'aiding and abetting'. I am quite prepared to sign the charge sheet on this! I am also hearing that the eoa claim to have apparently acted in accordance with their rules in expelling us. They did not. Any person subject to expulsion is entitled, in the rules, to a hearing, I asked for one but never even had the courtesy of a reply. They did however make up a whole raft of new, unapproved rules, perhaps these are the ones they adhered to? They say they were told by the RYA to take the action they did, this also is a travesty, as the RYA were apparently falsely informed that I was suing the eoa and was in dispute with them! Another lie. All this to remain in control of an owners group, when they had sold their boats and become non owners. As more and more sell up, there will soon be no one left in the eoa. As I withdrew my support for the committee a long time back, when it became apparent they were willing, some of them, to try every trick imaginable to deceive owners and members, it is immaterial to me. However I will pursue any person who defames my good name! I deal in truth, I am an ex police officer, with an unblemished record and a serving local government officer, I will not allow myself to be libelled. May 5th 2004. Just heard that two more of the eoa committee are selling their boats, Mr. Beazer's is advertised on www.boatsandoutboards.co.uk It was advertised for the hefty price of 14.5k, Dream on kiddo!! Now that price has disappeared! Has reality kicked in? For a boat of it's age, (built about 1973 from pre 'modified' plans), we would always say, 'buyer beware'. Rodney Leaper's WW is also on the market, an altogether much nicer boat, if rather basic. Would you like to advertise on the biggest and best M.G. site in the world lads? it's free! J.W. Hello All we are back, we had a great time, the 'ships log' includes sightings of many different birds, some quite rare, Crane, Kingfishers, Red necked Grebes etc. plus all the normal Norfolk wildlife. Got some pics of a WW too! Got a bit of dinghy sailing in as well. Important thing was dear old Mum had all her chicks by her for her 80th Birthday Holiday. She loved it! Will take us a few days to catch up on all your mail, thanks for your efforts! We have just heard that the big magazines have cottoned on to us and are giving us mentions, so hopefully more pics will be in for the site soon. F.G. will be back afloat very soon, see you all out there, good sailing, J.W. Barry and John, plus oft time crew Keith, all our spouses and aged Mother, are off on a boating holiday on the Norfolk Broads next week.. Different! Looking up a couple of our members too! Please don't give up if we do not respond for a few days, we get so much mail nowadays it will take a few days to catch up no doubt. Back Early May. Do not forget the 'Forum'. that works with out us there are others who look after that on your behalf. If you have a query try it, it does get read, we have the stats on it! J.W. Now is the time to get your ideas in, we are to make the final decision at The Bell Danbury May 26th! See the Burgee page for what we have so far and other comments. See also the Forum. J.W. We have also just signed up the 185th registrant! What does this say for our argument about an 'Owners' group being for owners by 'Owners', (and friends of course!). Someone aught to tell them 'others' (if they are still out there), that we listened and have far exceeded our expectations. Before the split the old assoc only had 125 in it, we doubt it is many at all now. We, on the other hand, are heading for the days when I was last president of the other lot and we had 250 plus! We believe the support we are getting is proof, if any were needed, of the depth of feeling re the deceptions and lies of some of them. We still ask, to what end, as they have clearly foundered, the assets, the plans, sinking into obscurity with them. Are they now just spiting others, by refusing to allow us to say where you could acquire a set of drawings? We have offered a helping hand, but it is refused, we can only offer, we cannot force them to take a lifeline. We do not wish to see them sink, the guilty parties will have left their ranks soon, the remaining owners, if they have any marbles, should put out that hand. J.W. Last Wednesday in March at Danbury. Great crowd 12 attending, many unable, sending apologies! We need more chairs and tables! Barry and John away for next one, off on Broads for week!, but maybe people can get together by using the Forum, so it can still go ahead in April. Look forward to May meeting. Burgee nearing reality. J.W. Have just noticed on the web that another of the old eoa vice presidents is selling his boat, or at least has put an inflated selling price on an advert for it! What did I say, will the last one to leave please turn out the light! Such dedication to their cause! J.W. Sunday 14th March. I have just added another 23 pictures to the site! Of the Riptide that Sid is launching this May. See the Riptide and the Builders pages. J.W. Sheathing your boat? We have within the group, a large roll of glass cloth, for epoxy sheathing. Small donations requested only, bottle of hootch for current keeper, and maybe £10 or whatever you chose for the use of the roll. We only ask you pass it back when you are done. Enough to do at least 3, E24s on the roll still! Contact John Morgan. Tele?????? Removed as today, 6th March, the roll is on the move again. Paul Usher will have it next. Contact us if you would like a length off the roll! John Williams. Last night, a very small group were at the Bell, Danbury, just 4 of us! With Doug and Jo and John and Anne away, others, including Darian busy, at Night School!, it was just a few of us to find out all about John Parry's Tuphnol boat! This has to be one of the most unusual boats ever. We are going to do a full spread on this boat soon. John is sending us some pics on a CD. John has promised to come back next month, hope for more in attendance to chat and help him plan his rebuilt, not that it look s as if he needs a lot of help so far! We have sorted out some meets too. Details on the events page soon. We are just 3 days short of our first birthday, 9th February. We have just had our 100th boat pic sent and we have over 160 owners and friends registered. In the few weeks that it has been running the new Forum has attracted hundreds of views and 30 registrants! We have received hundreds of letters and e-mails, many of which are on the letters page. We think we have got it about right, what say you? We are now going public, we already have the support of the big magazines, but we have left it till now to ask for a mention. We believe the hit counter will top 14,000 easily today, before our first birthday. That is more in a year, than we managed before in our three best years. What does that say? Barry and I would like to thank all of you out there for your support and help over the past year or so. This site is here to stay, no matter what! Breaking News 29.1.2004. mid day. Site upgrade!!! Due to the enormous amount of photographs, letters and articles coming in to the EOG, we have had to buy more web space! We have easily exceeded the 30 Mb , now the 100Mb, so we are now a 200Mb site!!! Well done to all those who have responded to our site, we are all indebted to your enthusiasm for our cause. J.W. We are already working on the second volume of the 'Newsletter' with another log and more building/restoring tips coming in. We are short on Senior pics, if you have any, and we are still waiting with bated breath for those 'Storm' pics. Anyone happen to know where 'Thunderer' is these days? Used to belong to friends Mike and Mandy Dyer, who moved off to Dartmouth area. The boat was sold on East Coast, but I have not come across her, have you? Anyway more info needed to bolster what has become an award winning, best boating site, all thanks to our supporters, well done. Latest, 22.1.2004. Barry and all of you are to be congratulated once again. The website has once more won the coveted 'Golden Web Award' 2003/4, for it's content, layout and design. Well done to all our contributors! Keep those mails coming in, the photo pages are groaning with new ones, logs please folks, and tech articles. A new 'Newsletter' to start next! Latest: Burgee competition! Last week we talked about it, now we have had our first drawings in. We ask for suggestions and ideas for a flag that we can have made, easily. simple designs would probably work best, so the dinosaur might be too complex. The black flag had some support but maybe it's a bit on the morbid side. So far Ann's Sunset has potential. More ideas please, keep them simple. An Evening star on it's own? An M.G. gull? We did decide the 'Churchillian' salute, though maybe appropriate, aught not be used! We have a page for displaying ideas, then a poll. By the way we have 140 plus 'on the books' now! Out of the ashes they created, the eventide owners association website 'tries' to rise again, but fails! I left a message on their new guest page congratulating them for getting going again, after screwing up their first two attempts, but asking for recognition for the photos they have 'pinched' from me, in particular the one I took of my friend Martin Lewis. I also informed them they had mistaken a Junior for a Senior, Riptide for Eventide and Waterwitch for Golden Hind, being the helpful sort that I am and them being so incompetent not to know their own designs... Needless to say they have deleted the comment! What a surprise. It was however copied by others and pasted back a few times, as others realised they were not about to have any comments from real owners on their site! The sort of dictatorship that prevails in the eoa will preclude any comment from anyone, other than the chosen few. Chris Beazer refers to all of us owners, as 'Cowboys' boasting 'We have the trophies and the plans' How infantile. They have them by default, not merit. We seem to have the support of the real owners. We did invite you to visit their site. Not any more, they have 'directed' us ( as is their way!) not to mention them, fair enough, but we fail to see how anyone will ever find their plans now. You would have noted that they cannot tell the difference between an Eventide, Riptide, WW or G.H.! You might have seen the pics they have purloined, noted the duff info. But you could not have left a message for them not for long, they deleted them! We invite them to explain themselves on our guest pages, we will not delete them unless they are offensive etc. Don't hold your breath though folks. We tried continue to do the right thing and show a link to them, but they have indicated we should not, so unless we hear to the contrary, all links have been severed. Sadly letters to The Sec and Mr. R. Leaper, go unanswered or acknowledged. About par for the course now. J.W. I would remind Chris Beazer and his ilk that the 'heart' of the eoa or even the EOG is embodied in it's members and supporters, not in the plans or trophies - however important they may be, forget this at your peril. June 13th We have now gone over the 200 Registrants to the site.